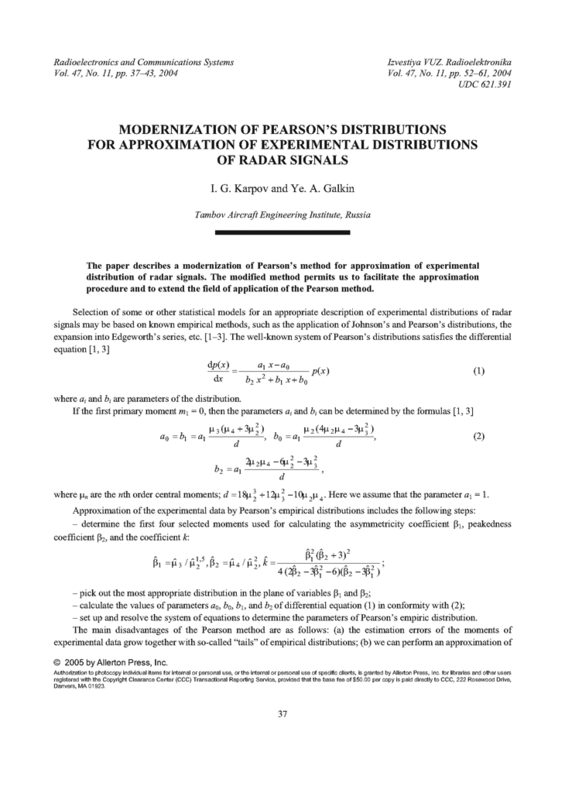 The paper describes a modernization of Pearson’s method for approximation of experimental distribution of radar signals. The modified method permits us to facilitate the approximation procedure and to extend the field of application of the Pearson method. KENDALL, M.G. ; STUART, A. The Advances Theory of Statistics. London: Charles Griffin, 1960. HAHN Gerald J.; SHAPIRO. Samuel S. Statistical Models in Engineering. Wiley & Sons, 1967. TIKHONOV, V.I. Statistical Radio Engineering [in Russian]. Moscow: Radio i Svyaz’, 1982. MALAKHOV, A.N. Cumulant Analysis of Random Gaussian Processes and of Their Transforms [in Russian]. Moscow: Sov. Radio, 1978. KARPOV, I.G. "Obobshchennye veroiatnostnye modeli fluktuatcii amplitudy radiolokatcionnykh signalov," Radiotekhnika, n.4, p.77-82, 2001.